The mastermind behind those legendary tunes is Brian Wilson, the multi-talented leader of the band. Wilson composed, arranged, and produced Pet Sounds. Twenty years after the album’s creation, Wilson’s mental state had deteriorated and he was living under the care of a manipulative psychologist named Eugene Landy. He found himself isolated from both his bandmates and his family. 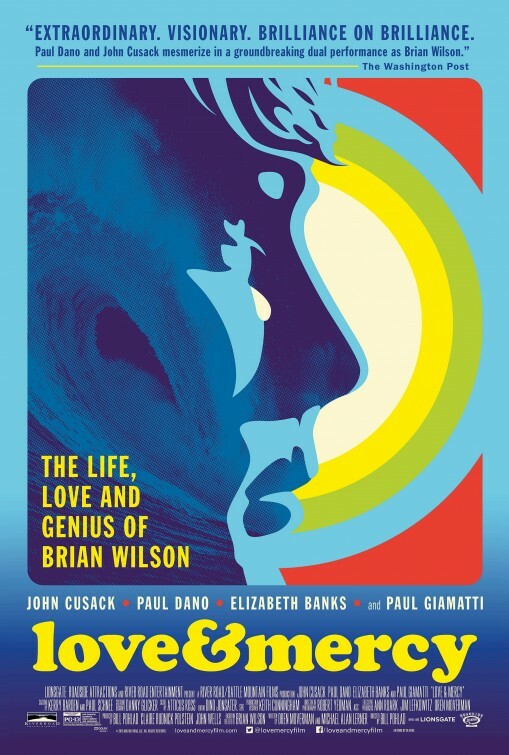 Love & Mercy tells the stories of both of these important periods in Wilson’s life — the mid-’60s creation of Pet Sounds, and his later struggles. Actors Paul Dano and John Cusack each take on the role of Wilson (Dano playing “Brian – Past,” and Cusack “Brian – Future”), joined by Paul Giamatti as Dr. Landy and Elizabeth Banks as Melinda Ledbetter. Bill Pohlad has created a fascinating film with Love & Mercy, different from any other musical biopic I’ve watched. The purpose of the film seems to be not to tell the story of the Beach Boys or of Wilson’s life thus far, but to help the viewer understand Wilson, both as a musical genius and as a human being. The film offers both an insider’s view and an outsider’s view. We’re able to see things as Brian sees them — his meticulous perfectionism regarding the Pet Sounds songs, his determination to do things his own way — but also from an outsider’s view, with Melinda’s perspective and those of the other band members also represented. The result feels very personal. 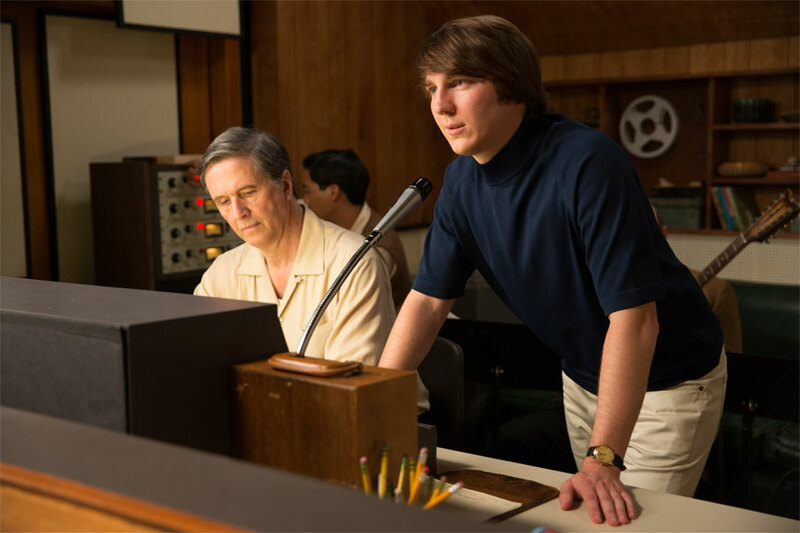 There is a very striking use of sound throughout Love & Mercy. In a number of scenes we hear things as Brian hears them — the amplified sounds of forks and knives on plates, drowning out all other noise, for example. The dual time periods are interwoven fairly well. The film moves back and forth from one of the other with the use of flashbacks. In one striking and surreal scene near the end, the time periods converge with scenes from Wilson’s childhood in a dream-like sequence. At times the film does feel fragmented and the transitions between time periods aren’t the smoothest, but I didn’t find this to be a huge problem. It’s impossible to review this film without mentioning the performances of John Cusack and Paul Dano. Both give strong performances, portraying Brian at very different points in his life. Dano in particular impresses with a portrayal that seems very honest and authentic. Love & Mercy is quite a dark film, with an overwhelming mood of melancholy, even when the pace lags a bit. Those looking for a biopic that matches the upbeat mood of the Beach Boys’ biggest hits should look elsewhere, but Love & Mercy is a fascinating and well-crafted film. Nice review here. I watched this recently myself, and it was a lot better than I expected it to be. Dano really impressed me, he clearly went all in here. I read an interview with the director who said that he flirted with the idea of having a third segment of the movie, the ’70s period in which Wilson was bedridden. Said he would’ve cast Philip Seymour Hoffman as Wilson for that sequence. Man, imagine that. Wow, that would have been great! I loved this movie. I think it might be my favourite of 2015 so far. Glad to hear you liked it! My favorite has been Far from the Madding Crowd but this one will rank highly, I’m sure.